Gianni Vio is someone I’ve held a long interest in – after all he shares my mentality on set-pieces and if you’ve read my other set-piece articles, you’ll know his career is someone’s I’m hoping to emulate in the very near future, so I wanted a glimpse into his mind, to help further my knowledge and to add to my library of set-pieces. To my surprise, Google didn’t throw up much information and YouTube only has small examples of his work, so I decided to create this piece, chronicling his work throughout career so far, detailing and examining every successful routine (and potentially some non-successful ones). If you’re not familiar with Gianni Vio, he is a set-piece coach that used to dream up set-piece routines during his day job as a banker in Mestre, Venice, it was this passion for set-pieces that prompted him to launch a website detailing all these routines. The website lead to a book which lead to an email from ex Italy and Inter Milan goalkeeper Walter Zenga. Zenga had read Vio’s website and was intrigued and the pair kept in contact regularly exchanging schemes and routines. Vio’s big break came when Zenga took over as manager of Catania in April 2008. Zenga persuaded the owner to hire Vio and fly him down from Venice to take set-piece sessions. Vio was a success – launching a decade-long career in the professional game in the process. Vio’s first game in charge of set-pieces came on the 6th April 2008 against Napoli, and his impact was immediate, with Catania winning 3-0 with 2 goals scored from set-pieces – a free kick and a corner. Vio crams 7 Catania players into the box for a free kick from the left-wing. Just before the kick is taken, 3 players rush out of the box creating disarray in the Napoli defence (check out the looks of confusion on the Napoli defenders face! ), whilst 4 players rush in. The delivery is aimed for the near post and the split second of confusion is enough for a tap-in at the near post. I’m unsure here if Gianni Vio is taking advantage of the way Napoli defended corners or is expertly creating a distraction from the real plan (or indeed a combination of both). The front post area is crowded with 3 Catania players, this draws 4 Napoli players into the 6-yard box to defend and draws the brunt of the goalkeeper’s attention. Meanwhile, the “harmless” player on the edge of the box that doesn’t even have a marker assigned to him makes a surging run around the back for a first time shot that’s poor, but he makes no mistake from the second shot, firing home into the roof of the net. A runner to the near side of the 6-yard box draws 3 Juventus defenders, whilst the others peel off to the middle of the 6-yard box for an easy header home. An odd one this… The player on the far side leaves the box to distract the defence (although nobody seems to notice) whilst the rest of the players make their attacking runs, bizarrely they aren’t needed as the ball flies in, directly from the corner. The first successful use of one of the main parts of Vio’s philosophy that he still uses almost a decade later. A direct free-kick about 20 yards out. 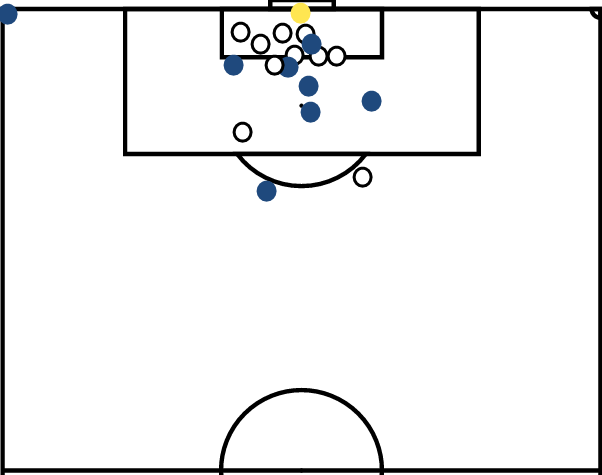 Every player taking the free-kick in this location will want to shoot and Vio lets them, but what stands out is his use of the rest of the team. Vio is a big fan of screens from free kicks and it’s easy to see why when you think about the reasons why. The goalkeeper needs to see the ball in order to save it if the ball makes it past the wall, the later the goalkeeper sees that ball the harder it is for him to save. So Vio gets his teams to create another wall in either in front of the goalkeeper (obscuring his vision of his own wall) or mixed in with the defending wall. This gives the goalkeeper a second or less to see the ball – a vital difference. Sadly I have been unable to find any footage (only written coverage) of this match, if you can track it down I’d be most grateful! Again we see the free-kick screening method, this time with 2 screens employed – one in front of the defensive wall and one behind. As the kick is taken the Catania wall in front of the goalkeeper runs forward (so they won’t be caught offside), the front wall splits – with one player looping round to get on the end of any rebound or spill from the goalkeeper, although in this case it’s not needed! An interesting use of numbers and space makes this a very interestingly laid out free kick. Catania space 3 players close to the free-kick taker and spread the rest of the players out across the Roma half. 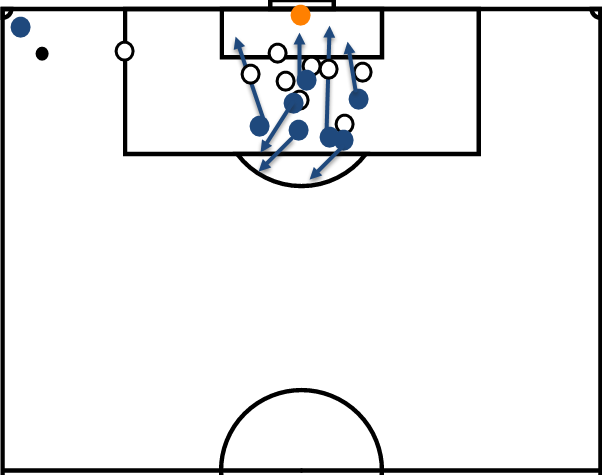 The effect of this is Roma having to also spread their players out across the half to mark the Catania players. This means when the ball is played forward, all it requires is a simple flick-on for a one on one with the keeper which is duly dispatched. Catania catch Bologna napping here, a quickly taken free-kick finds a Catania player in space in a dangerous position, and he slots home from a tight angle, simple but effective! A pretty simple routine where Reggina are desperately unlucky. The ball is played into the far post where there’s a runner from deep, the delivery isn’t the greatest and the Reggina defender should clear with ease but somehow falls over, allowing an easy finish. The footage is terrible (but the best I could find) but a corner is floated into the back post where 2 Catania players are grouped. The corner finds them and it’s headed in, simple but effective. Another one of Vio’s famous screened free-kicks. Catania players are grouped in with the Roma wall, with 2 players on the edge of the wall (highlighted with arrows) that follow the free-kick in. Upon the taking of the free-kick the Catania players split, creating a huge gap in the Roma wall as the ball rockets into the net. I honestly can’t tell if this routine went as intended or if there were large elements of luck to it, but either way – it’s a superb routine. The player nearest the kick-taker (we’ll call him player 1) backs off giving himself a bit of space. The kick is taken and whipped towards the edge of the 6-yard box where it’s knocked back to Player 1. He then plays a delicious chip towards the back post where a couple of players have made their runs – with the initial ball and knock-back have allowed them to lose their markers. It’s clear after looking at these routines that Vio has a few key components (that’ll be interesting to see if and how they evolve later on!) that make up his philosophy this early on in his career. The first is the free-kick screen as discussed earlier on in the article. This is something so simple and obviously effective yet I’m baffled more teams don’t do it. As the years have gone by we are seeing it more, but not nearly to the same extent that it SHOULD be done – it’s fairly common to have at least one offensive player amongst the defensive wall, but teams should also always place a screen in front of the goalkeeper, the shot is going to be taken – why not help out the kick-taker as much as you can? The next key component is the back post. It’s a recurring part of all of Vio’s routines looked at so far to have at least one person attacking the back post. It’s this player that will be most likely to have lost their marker (linked to the next key component) and can either get on the end of a good delivery or slot home from any spills or rebound from the goalkeeper further enhancing the chances of success. The final component that’s emerged in this early stage is that of chaos. Vio seemingly looks to create as much chaos and confusion in the opposition defence as possible, creating scenarios they either don’t know how to deal with – such as the free-kick screen or players running out of the box when the ball is delivered into the box or simply can’t deal with like spacing players out (which will spread the defence out) or taking the free-kick quickly. In his first 50 games in charge of Catania’s set-pieces Vio contributed 14 goals and other teams began to take notice, but he was to stay at Catania for another 3 seasons – which will be explored in forthcoming episodes.